"Breakthrough Technology Puts YOU Inside Your Prospects' Heads For More Leads, Shares and Sales..."
This Comprehensive Audience Research Platform Makes Old-Fashioned Keyword Tools Obsolete. Get Started with WordRecon Today! Discover a World of Keywords That Are.. Leverage on multiple, major keyword auto-suggestion sources to uncover lucrative, high-traffic keywords your competitors never knew existed. Discover raw keywords exactly as they were typed into search engines and search boxes on major websites by millions of real people everyday. Find ultra-targeted keywords in any niche or market. Coupled with asterisk wildcard search, you will get keywords with unparalleled relevancy. A huge number of keywords with substantial search volumes are hidden by Adwords. Use these sources to reveal these low-competition gems. 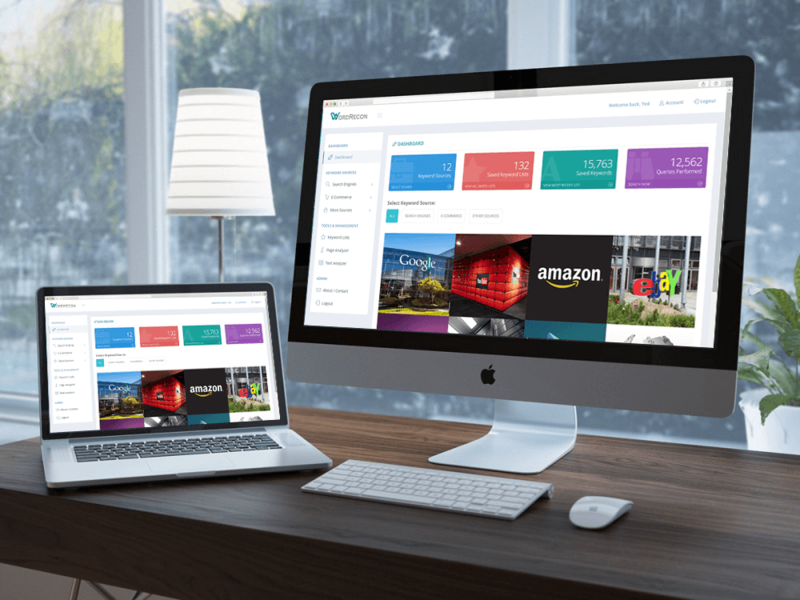 With 8 e-commerce keyword sources, you'll have access to highly-coveted buyer keywords that are invaluable to e-commerce/physical product sellers. Despite what the metrics tell you, if a keyword earned its way into keyword suggestions, you can be certain it is getting good organic search traffic. 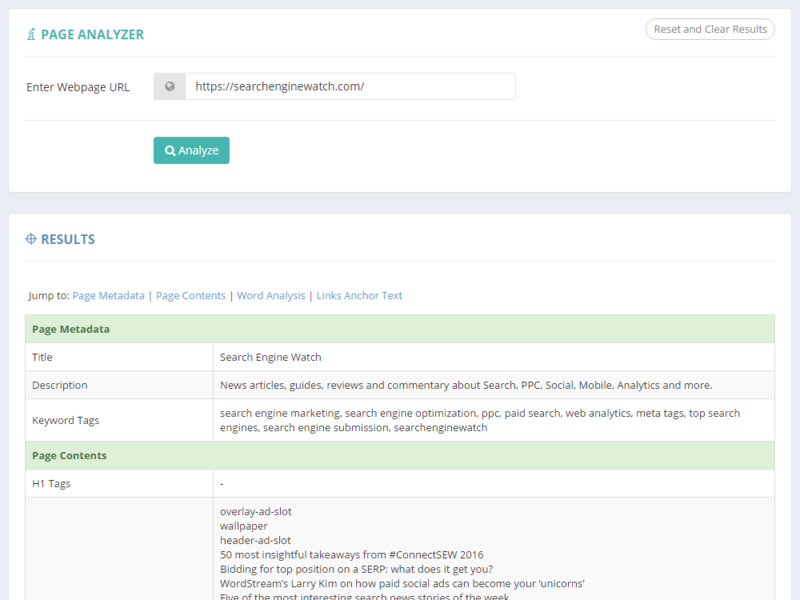 Get a true bird's eye view of what millions of real people are actively searching for everyday. The best way to discover keywords, as proven by thousands of successful websites, is to use the very keywords that are auto-suggested by search engines. There's a reason why these keywords are so effective: they are exactly what people are searching for. With support for 8 e-commerce keyword suggestion sources, in addition to the major search engines, there's no better way to uncover tens of thousands of lucrative buyer keywords that help you get in front of buyers moments before their purchases. The riches are in the niches. 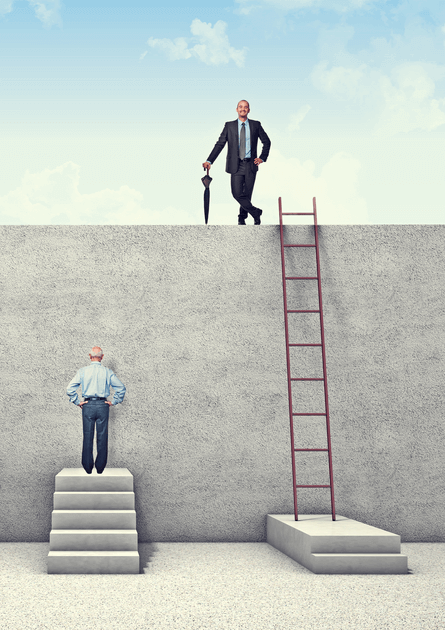 Indeed, there are often so many niches you can find in a single market that you will almost always come across several that are being neglected or overlooked. These low-hanging fruits are easy opportunities waiting for you to tap into. There is no better way to find profitable opportunities than to turn your attention to the pain points of people. Identify a burning pain or frustration in any target audience, and selling a solution that solves that pain for this audience will be easier than you think. WordRecon is a long tail keywords powerhouse. By using data from 18 keyword suggestion sources, you will uncover significantly more long tail keywords with little competition than with Google Keyword Planner or any other keyword research tools. There are very few places where you can find out the exact search phrases people are typing into e-commerce websites. WordRecon enables you to access these keywords, giving you game-changing insights that will help you succeed in your e-commerce business. Are you using the right keyword sources? Whether you are doing SEO, content marketing, niche research or any other kind of online keyword research, the bottom line remains the same: the most effective keywords are those that match what real people are typing into search engines. Unfortunately, most keyword research tools on the market are based on data from the Google Keyword Planner, which is why keywords found using these tools are often too broad, overly competitive or unrelated at times. This is no surprise as Google Keyword Planner is known to hide keywords with search volumes to bias advertisers towards other keywords. In other words, the keywords you will find using such tools are filtered and generalized for paid advertising. Seasoned SEO experts know this for a fact and rely on a particular source to uncover valuable, little-known keywords that can never be found using conventional keyword tools. This source is none other than keyword auto-suggestions of search engines. WordRecon is purpose-built to uncover exact search phrases that people are typing into search engines by harnessing keyword auto-suggestions from 18 sources, enabling you to uncover the most effective and relevant keywords for SEO, video marketing, blogging/content marketing, e-commerce or any other type of keyword research that has to do with attracting and driving traffic to your website or offer. "Keyword suggestions are the most effective keywords"
See what industry experts and authorities are saying about keyword suggestions..
AdWords is omitting data to bias advertisers toward certain keywords. That's where Search Suggest comes in. It can help us recover that valuable keyword data and identify terms & phrases AdWords won't show us until we explicitly enter them. Google's Search Suggest is a wonderous feature. 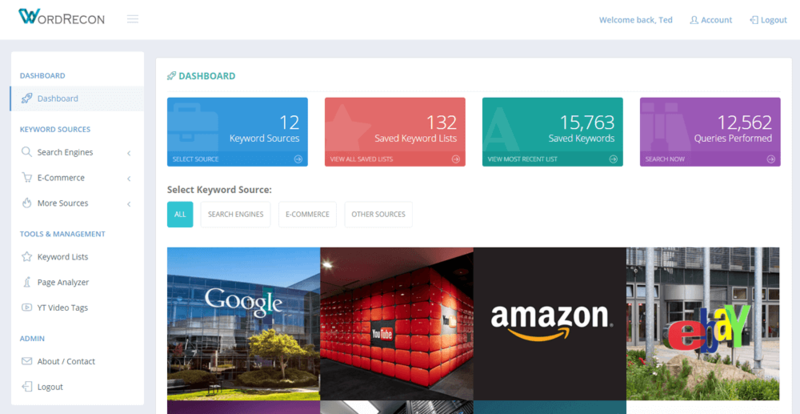 It's also a phenomenal keyword research tool for marketers. You can use Google itself to source topics, just by entering the phrase and seeing what related phrases are suggested. It's a time consuming process, but you can also use a tool to do it all at once. It's a goldmine of ideas for content marketers. The search queries that you see as part of Autocomplete reflect what other people are searching for and the content of web pages. The algorithm is based on a number of objective factors, including how often others have searched for a word. Google Autocomplete can be a useful tool for identifying keyword opportunities. But did you know it is also an extremely powerful tool for content ideation? You can turn an Autocomplete topic from a good content idea into a link-building, traffic-generating powerhouse for your website. 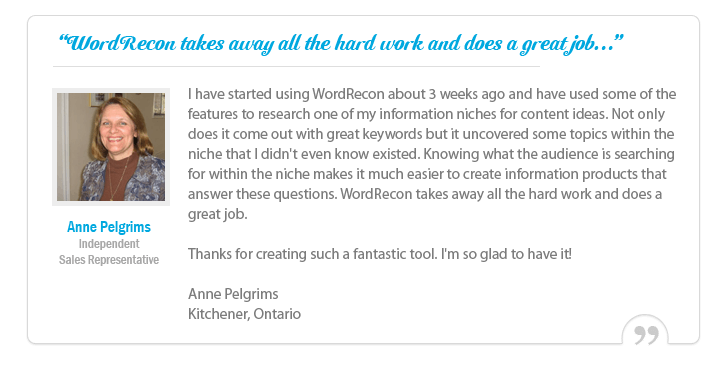 "WordRecon is not a mere keyword research tool. 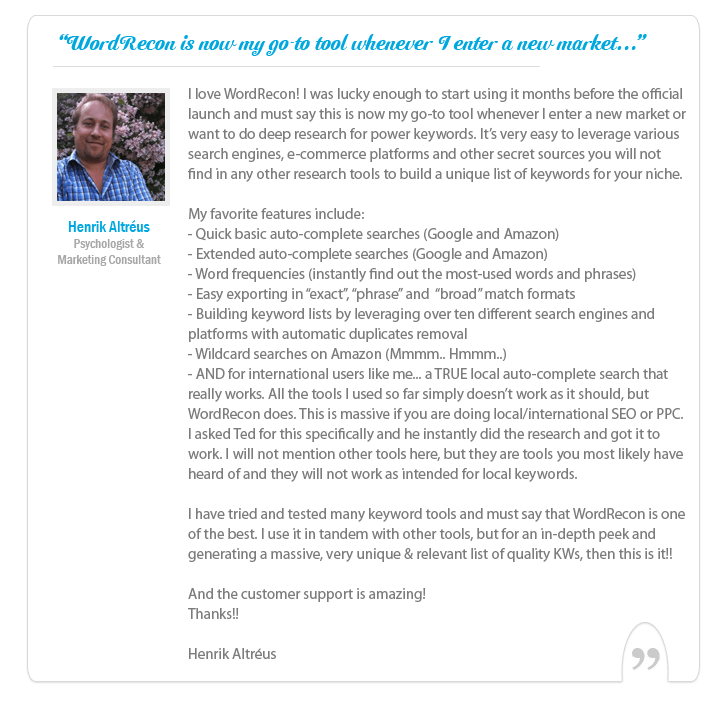 WordRecon is a complete audience research tool for discovering profitable new markets you never knew existed." Lock in to these rates for as long as you are a member with us. Your purchase of WordRecon today is absolutely risk-free. Your purchase is fully backed by our 30-day, 100% money back guarantee. Take WordRecon for a spin over the next 30 days. We want you to be completely satisfied with your investment in WordRecon today. In the unlikely event that you're unsatisfied in any way, simply contact our support desk and show us you've at least tried the software and training for your full money back within the first 30 days of your purchase. 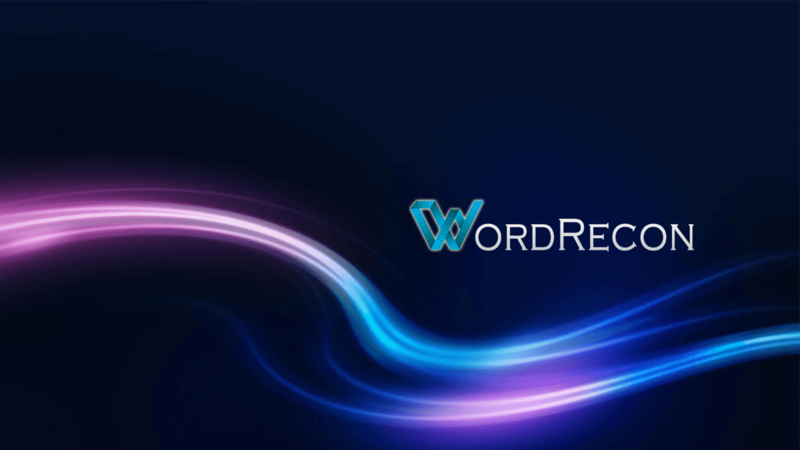 We are absolutely delighted to introduce you to WordRecon, the audience research platform that brings you data from queries typed in by real people looking for products and solutions. And this makes all the difference in your marketing. You'll get all the information you need to make the right business decisions - instead of guessing or depending on unreliable sources. Before now, solopreneurs and small business owners were held back by the lack of reliable and affordable audience research tools on the market. This ends the frustration for good. And it's all backed by a full 30-day, 100% money-back guarantee. Make the decision now to start gaining valuable insights into any market or niche. Check out these actual screenshots of WordRecon in action. WordRecon packs a punch under its deceptively simple interface. WordRecon is completely cloud-based and works directly on your PC or Mac without installation. WordRecon works beautifully on your mobile devices and phone so you can use it anywhere. The only tool that displays the number of occurences of each word in search results. 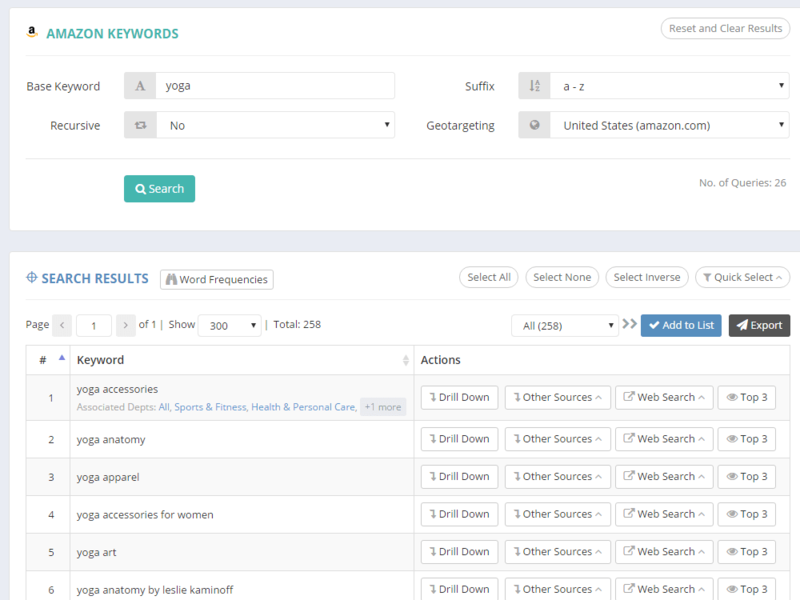 Intensive search options allow you to perform in-depth keyword research in any market/niche. 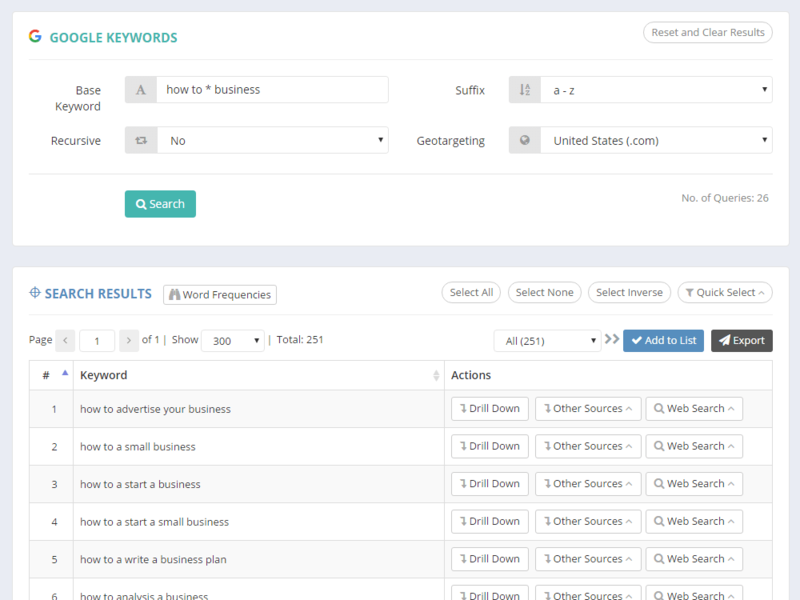 Uncover higly targeted and relevant keywords that match exactly what you are looking for. 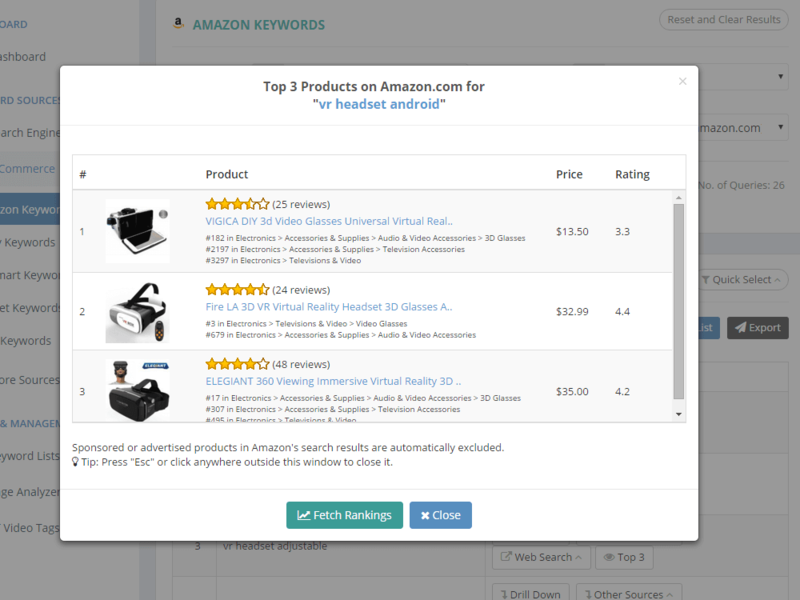 Quickly check the top 3 products on Amazon for a particular keyword in a single click. 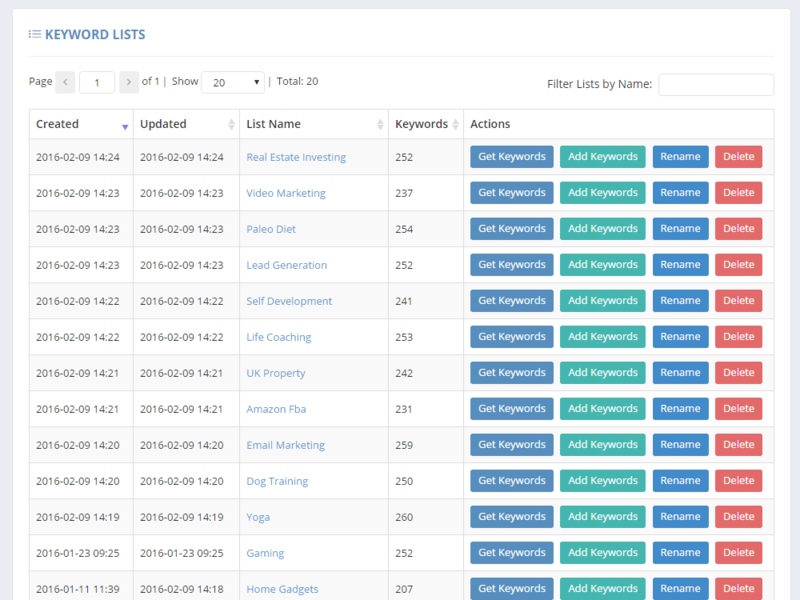 Easily select, filter and save keywords to lists which you can access anywhere conveniently. Target your keyword research to any specific country to get the most relevant keywords. E-commerce keyword sources support display of departments associated with popular keywords. Built-in tool that extracts metadata, such as keyword and anchor tags from any web page. 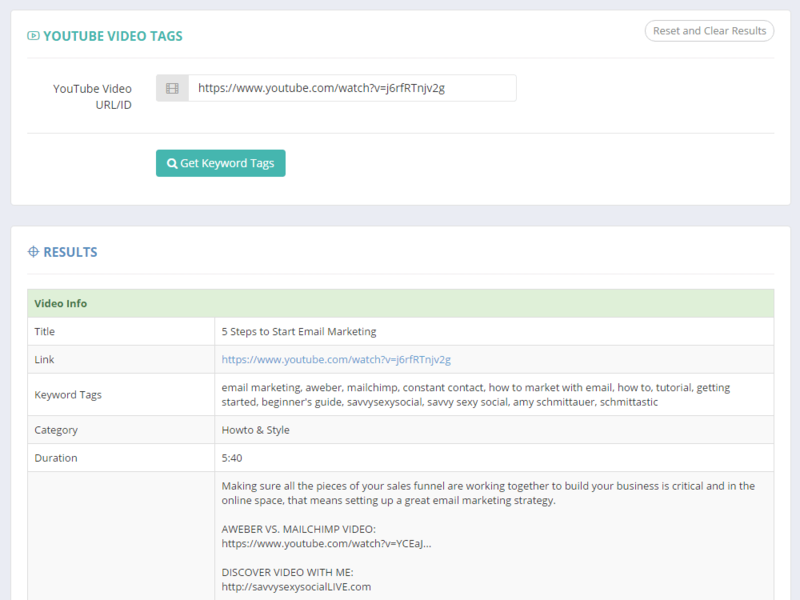 Built-in tool that enables you to discover the keyword tags of any YouTube video. 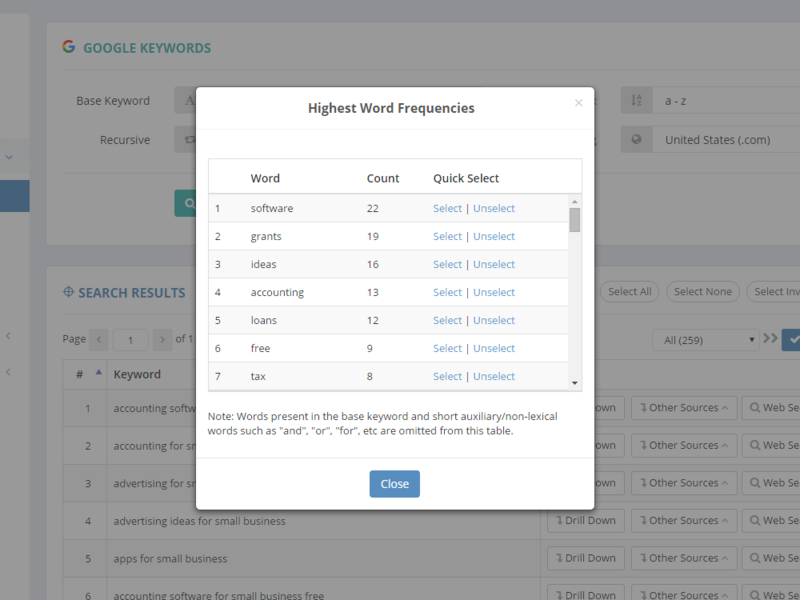 Easily export keywords to Google Keyword Planner or any other tool for analysis. "All tools are built, but some are built to deliver results." 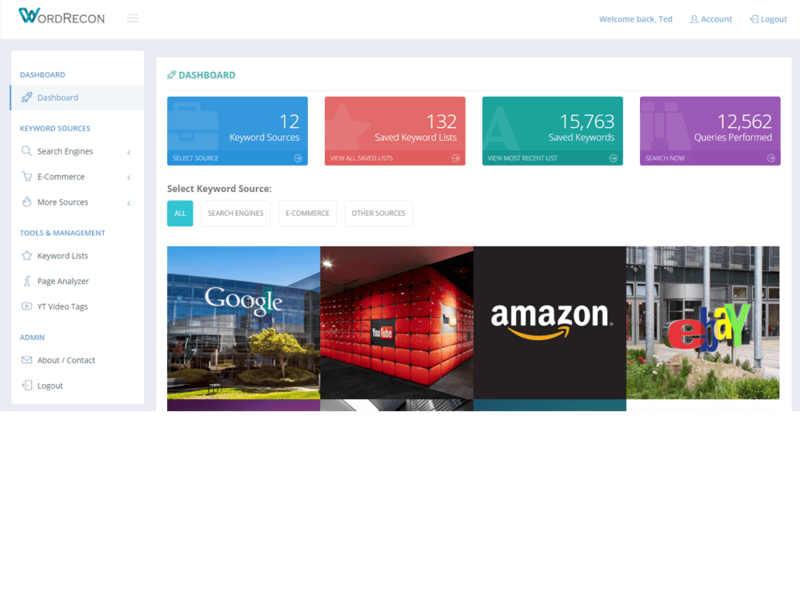 Get instant access to the most comprehensive audience research platform ever built. ever built for online marketers and entrepreneurs. WordRecon is not affiliated with any search engines or e-commerce retailers.